Evidence that Demands a Verdict is a title well known to many Christians. The book was originally published in the early 1970’s by Josh McDowell as a source book for Christian apologetics. It both presents arguments and points readers toward more in-depth arguments for the truthfulness of Christianity. Given the four decades since the book’s original publication, many of the sources in the first edition are outdated. Over time, arguments change, new evidence for or against positions is considered, and scholars on all sides of the debate reframe their thoughts. It was high time for this book to be updated. 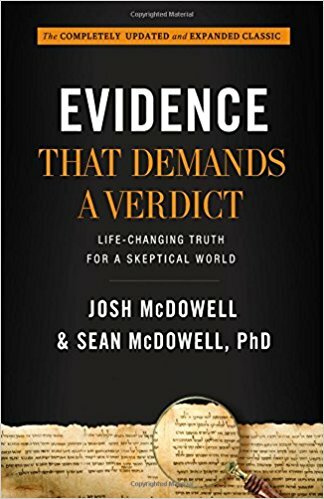 This year, Josh McDowell and his son, Sean, have released an expanded and updated version of this classic work on apologetics. This volume adds the credentials of the younger McDowell to the senior's extensive apologetic experience. The younger McDowell is an apologist, serving on the faculty of Biola University. Evidence that Demands a Verdict is the sort of book that defies concise summary. At over 700 pages, it makes a satisfying thunk when set on the table. That alone may be enough to add gravity to the claims of a budding apologist. It has a helpful table of contents with chapter abstracts, as well as subject and author indices, which keep this tome from being unwieldy. The arguments are laid out in logical chunks in outline format. This makes the book suitable for research, though it might make cover-to-cover reading more difficult. The McDowells have covered the major questions of Christian apologetics. They invest five chapters discussing the historical reliability of Scripture. Eight chapters help demonstrate the historicity of Christ and his resurrection. There are thirteen chapters dedicated to the reliability of the Old Testament. The last major section includes six chapters arguing that truth is possible, with an attempt to counter certain claims of postmodernism. The beauty of this book is that it has been well seasoned over decades and targeted to engage ongoing discussions charitably and at the point of contention. This enables the arguments in this volume to cover a great deal of territory in relatively brief space, which may seem amazing, given the length of the book. That the authors have covered such broad ranging topics in such a short space is a gift to Christians seeking to understand the major points of the plurality of debates about the truthfulness of Christianity and, hopefully, engage their skeptical friends with the truth of Scripture, especially the gospel. This really is a good, first stop for a number of excellent arguments. At the same time, the target audience (regular Christians) and the brevity of some of the discussions sets the volume up for its likely criticisms. There is no doubt the war drums of some Christian philosophers will be beaten as they line up to critique some of the interpretations of the volume. For example, the section on postmodernism is an easy target since the subject matter has more publicized versions than the number of scholars that have argued for it. This makes every generalization about the subject a target for critique, and, since many postmodernisms conflict with one another, there is no safe ground to argue against the general drift of thought. (Part of the joy of being postmodern seems to be the ability to say your critics don’t get it as you smile smugly.) If readers accept that the chapters in this volume are introductory and not exhaustive, this book stands up to reasonable scrutiny. It is unlikely that most people will read this volume cover to cover. It is constructed like a reference book and will serve that purpose well. At the same time, the length of the chapters would make it useful for study with a group of young Christians. It is unlikely any group would make their way through the entirety of the volume. However, it would be a helpful resource to introduce someone to some of the credible arguments for Christianity. The book might serve well as a secondary volume in an apologetics course at the college or seminary level, with some assigned readings chosen to introduce particular topics. Again, it would be difficult to get through the whole volume in a semester or year. The most important use of this volume is as a way to self-equip for the ministry of evangelism in a skeptical age. The chapters are useful for buttressing the faith once delivered to all the saints. They are also helpful in showing how to frame an argument against the common objections to Christianity. This is a handy resource for a Christian engaged in the Great Commission. Evidence that Demands a Verdict is a classic work. The updated edition has done exactly what it should do: added new arguments, updated sources, and retained the positive qualities of the original. This is a book that should be in church libraries, on the shelves of pastors, in the homes of Christian parents, and among the recommended resources for new believers.